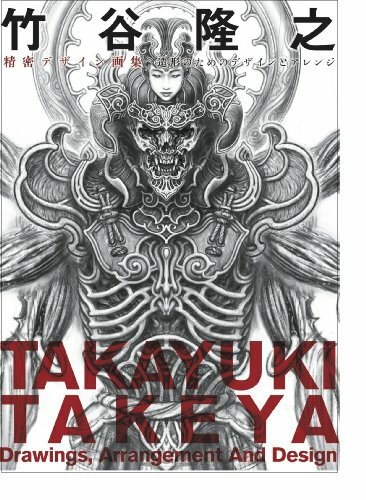 This is the concept artbook of Japanese artist and sculptor 竹谷 隆之 (Takayuki Takeya, website | facebook). This book consists mainly of character designs and the concepts for his sculptures. From what I can see in the book, he's been involved in a lot of projects. I can't read the project names which are in Japanese and the only ones in English are Final Fantasy, Alien and Predator. The artworks are created mainly using pencils. They are very detailed in terms of line work, shading and design. The fantasy character designs are fascinating. He has also designed several non-lead characters for Final Fantasy, such as the creatures, the mythical beings. There are also designs that look like traditional Chinese deity statues. Some characters remind me of H. R. Giger's style but there's of course the Japanese influence mixed in such as when designed samurais or weird action superheroes. His drawings have a distinct 3D form, enhanced by the pencil shadings. The book also has many drawings for the sculptures where the characters are designed to the base they stand on, or the setting they appear in. Takayuki Takeya has created a lot of awesome sculptures, but unfortunately in this book, there are only 12 pages dedicated to showing them. You'll see a lot more when you search for images online. It's an artbook that's definitely worth checking out.